Located 02 miles E of Truckee, California on 2280 acres of land. View all Airports in California. Surveyed Elevation is 5904 feet MSL. GLDRS USE LEFT TFC RWY 20. RWY 20 & RWY 11 DIST-TO-GO MKRS INSTLD ON LEFT SIDE. SIMULUS OPS ON RWYS 11/29 AND 2/20. CLSD TO ULTRALIGHT ACT EXC BY PRIOR PMSN. ACFT CPBL OF OPERG ABV 80,000 LBS MUST SMT CERTIF TO AMGR VFYG ACFT OPERG WT IS LESS THAN 80,000 LBS. VOLUNTARY CURFEW: NO ENG STARTS ARR OR DEPS EXC PPR OR LIFEGUARD FLTS 2200-0700. PREF CALM WIND RWY USE RWY 02/20. SPECIAL HAZARD: MOUNTAINOUS TRRN SRNDS ARPT AND RWYS; EXPC WINDSHEER AND DOWNDRAFTS. SUMMER DENSITY ALTS IN AFTNS FRQLY EXCEED 9000 FT.
GLDR AND SKYDIVING OPNS NE OF ARPT MAY-SEP. 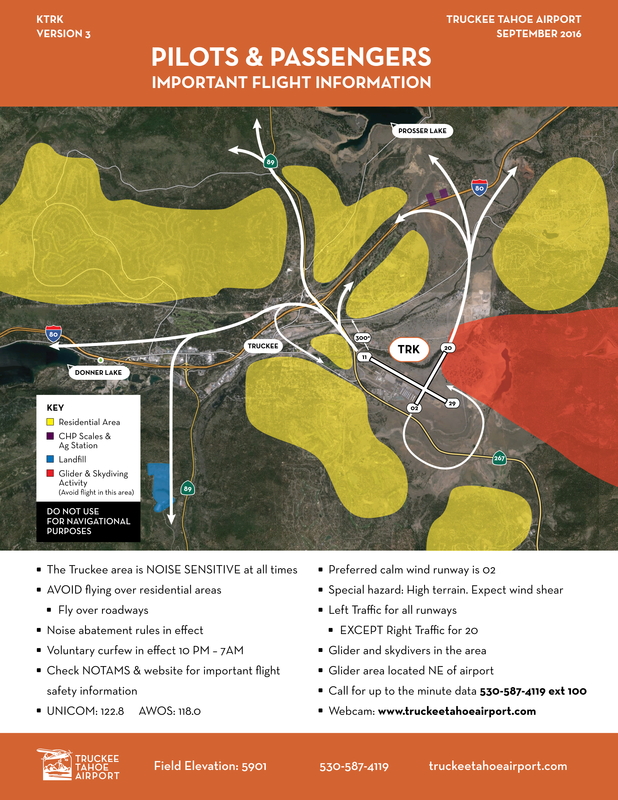 WHEN ATCT CLSD ACTVT REIL RWY 11; MIRL RWY 2/20 & 11/29; VASI RWY 20 - CTAF.